I should begin by pointing out that this post is in addition to a few notes that Jacob P. Breeze has already posted on his blog. There, Jacob asks if insights from archeology might inform our understandings of baptism? I have been wondering the same thing. Now, I’m no excavator of ancient ruins but I am an exegete of texts and ancient culture. That said, I am well aware that it was not uncommon in the ancient world for persons to be buried together. In fact, when one tours the ancient world, they see this practice all over the place--I did! 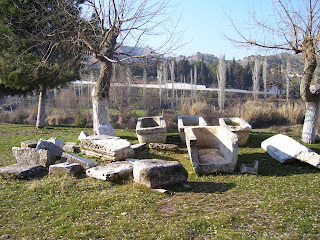 I’ve included some photos from antiquity here that show communal burial. There first one is from the city called Necropolis. I actually walked into the tomb in this picture. There were slabs/shelves that held the bodies. 10 or more bodies could have been easily stored in this tomb. 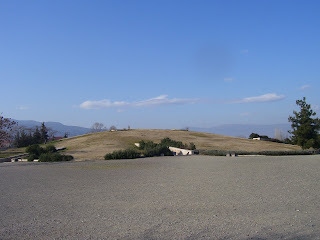 This next picture is of a tumulus (a hill/mound that contains tombs/coffins). 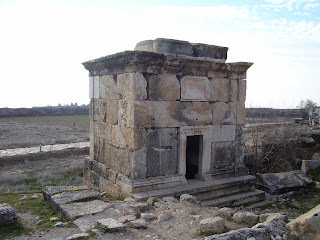 In fact, this is the tumulus of Philip, Alexander the Great’s dad. In these tumuli, families were often buried together—we might compare it to a family graveyard today. In this photo, you see some sarcophagi, coffin-like boxes that held single or multiple bodies. Many of these have been uncovered in Sardis—that’s where this photo is from. Furthermore, baptism was seen by the Early Church as the event whereby the baptizee was initiated into the Church / Body of Christ. It was also in this event where one began to enter into a saving relationship with the Triune God, receiving forgiveness of sins, the indwelling of the Spirit and spiritual gifts. In our individualist culture, we would all do well to keep this in mind. Indeed, baptism is, in its own right, a communal event, just as salvation is a communal gift.